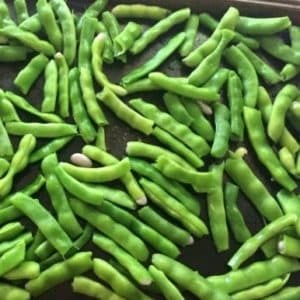 August 21, 2017 0 comments on "How to Freeze Green Beans"
Did you ever wonder how to freeze green beans? I am an avid canner, but I also like to freeze some fruits and vegetables, depending on what I am going to use them for. Canned green beans are good, but they are really soft like canned green beans from the store. Some of my family likes canned green beans, but some prefer the taste that green beans have when they are fresh and more crisp. Green beans lose that quality when they are canned. When you freeze green beans, they stay more crisp like fresh green beans. So I decided to freeze some green beans as well as can some this year. I am also running short on canning jars and need to save some for my homemade salsa, so it will help to get some of these green beans in the freezer. When you freeze vegetables, it is best to blanch them first. Blanching is the process of boiling them for a very short amount of time, and then quickly cooling them down with ice water. The purpose of blanching is to stop the breaking down of the enzymes inside of the vegetables. After vegetables are harvested, the enzymes break down and cause the quality of the vegetables to deteriorate. This process causes the loss of valuable vitamins and minerals. Blanching the vegetables interrupts this process and helps keep your frozen vegetables fresh longer. It also helps preserve the bright colors of the vegetables. Try to harvest your green beans first thing in the morning. Place the green beans in a colander and rinse them well. Get your family together and have them help you snap the ends off the green beans. Snap off each end of the beans, and if they are extra long, you can also snap them in half. While you are preparing the green beans, place a large stock pot half full of water on the stove and start heating the water. When the green beans are ready and the water is boiling, place the green beans in the boiling water and boil them for 2 minutes. Remove the green beans from the water and place them in a large bowl or in your kitchen sink and cover them with cold water, adding ice if you can to cool them quickly. Drain the green beans and blot them with paper towels, trying to remove as much moisture from them as possible. If you “flash freeze” the green beans they will not stick together in the ziploc freezer bag. You can flash freeze them by placing them on cookie sheets in single layers and placing the cookie sheets in the freezer. When the green beans are frozen, transfer them to gallon sized ziploc bags. When you want to use the green beans in the future, all you have to do is remove the green beans you need from the bag and return the rest to the freezer. Green beans will stay fresh in the freezer for 6-12 months.